The rising prevalence of the cancer is likely to propel the growth of the global tissue diagnostic market in near future. The development of infrastructure in the healthcare and medical sector is another factor attributing to the overall growth of this market in near future. Additionally, increasing awareness about the qualitative and quantities analysis of the tissue samples, high awareness about tissue diagnosis and the discovery of the specific target antibodies in the biopharmaceutical sector are some of the important factor driving the growth of the global tissue diagnostic market in coming years. Also, the increasing need for improvement in healthcare infrastructure and the better treatment of cancer patients have positively upsurge the demand of the tissue diagnostic over the forthcoming years. Apart from the cancer cases, the geriatric population may likely to influence the growth of the tissue diagnostic market, across the globe. Also elderly population are highly vulnerable to disease and requires medical check-up on the regular basis. This could be another factor augmenting the demand of the tissue diagnostic market, globally. On the other hand, the delay approval of new treatment and other potential test by the Food and Drug Administration (FDA) hampers the growth of the tissue diagnostic across the globe. Also, despite high expense of the diagnostics, growing awareness, and rise in merger and acquisition, innovation and rise in disposable income could be some important factor influencing the expansion of the market in near future. The global market for tissue diagnostic is segmented on the basis of product type, technology and end user. Among all these segment, Tissue diagnostic instruments have been enjoying a greater demand from end users than the diagnostic kits. Whereas, if the increase usage of these instruments in laboratories, diagnostic center and healthcare, this segment is projected to remain key contributor this market throughout the assessment period. Also, the expensive treatment charge and diagnostic test could be another factors restraining the growth of this market. On the basis of geography, North America could projected to remain the dominating market on account of increase in research activities, highly-established pharmaceutical industry and biotechnology industry in coming years. In recent periods, the North America market could be thoroughly followed by Asia Pacific and Europe and the overall scenario in this region likely to remain same in near future. The market for tissue diagnostic in Europe could be compelled by the following factors such as the increasing investment from the research organization for the advance study of the cancer, implementation of government regulation as well as advancement of technology in pharmaceutical industry. Also, Asia Pacific is likely to dominate the market in terms of drug discovery and due to ongoing industrialization in coming years. The study also provides few prominent players operating in the global market for tissue diagnostic such as Roche Diagnostics, Abbott Laboratories, GE Healthcare, Genomic Health Inc. and Agilent Technologies. This report on tissue diagnostic market studies the current as well as future prospects of the market globally. The stakeholders of this report include companies and intermediaries engaged in the manufacture and commercialization of various tissue diagnostic instrument and products as well as new entrants planning to enter this market. This report comprises an elaborate executive summary along with a market snapshot providing overall information of various segments and sub-segments considered within the scope of the study. This section also provides the overall information and data analysis of the global market with respect to the leading market segments based on major products, applications and geographies. The market overview section of the report explores the market dynamics such as drivers, restraints, and opportunities that currently have a strong impact on the global market and could influence the market in the near future. Market attractiveness analysis has been provided in all the sections of the report in order to explain the intensity of competition in the market across different products/materials/technologies/end-users/geographies. The competitive scenario among different market players is evaluated through market share analysis in the competition landscape section of the report. The section also includes completion matrix that analyzes the competition among some of the top global players operating in the market. All these factors would help market players to take strategic decisions in order to strengthen their positions and expand their shares in the global market. The global tissue diagnostic market is divided into: by product, by technology, by end-user and by geography. Product type segment of tissue market was divided into instruments and kits. On the basis of technology the market is classified as immune histochemistry, in-situ hybridization, digital pathology and special staining. On the basis of end-user the market is classified as hospitals, ambulatory surgical centers, diagnostic centers and research laboratories. 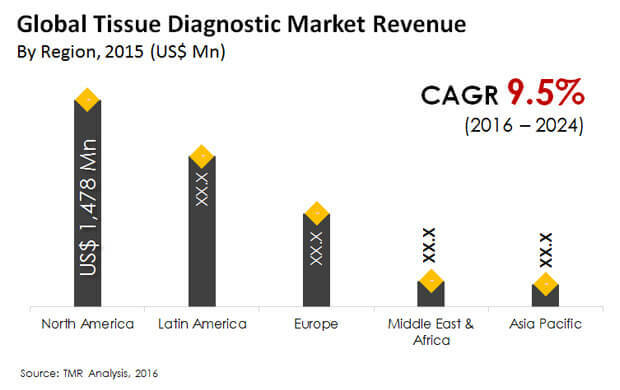 Geographically, the tissue diagnostic market has been segmented into five regions: North America, Europe, Asia Pacific, Europe, Middle East & Africa (MEA), and Latin America. Each regional market for market has been further categorized into major product, applications, material, and end-user segments considered within the scope of the study. Key country (U.S., Canada, Japan, Germany, France, U.K., Australia, Canada, China, Brazil, Mexico, India, etc.) market revenues have also been provided in different regional sections within the report. Market revenue in terms of US$ Mn and volume in terms of units for the period from 2014 to 2025 along with CAGR % from 2016 to 2025 are provided for all the regions and nations considering 2016 as the base year. The report profiles key manufacturers in the tissue diagnostic market based on various attributes such as company details, SWOT analysis, strategic overview, financials, and business overview. Major players profiled in this report include F Hoffmann-La Roche, Thermo Fisher Scientific, Agilent Technologies, Abbot Laboratories, GE Healthcare, 3DHISTECH Ltd., Genomic Health, Cell Signaling Technology, Inc., Danaher Corporation and Becton, Dickinson and Company.